Stay warm, get comfortable, and show off your precious Boston Terrier in this adorable personalized pet gift! 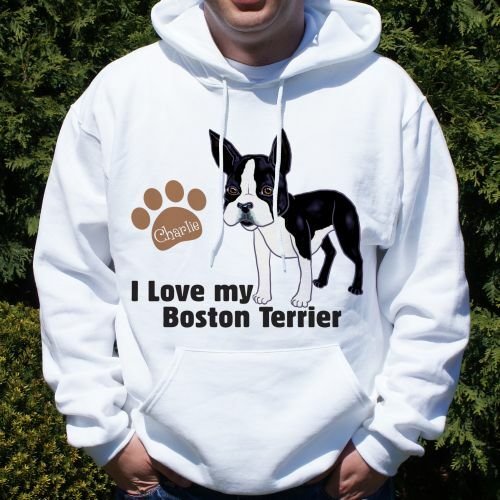 The heartfelt message and personalized touch will make this hoodie a must-wear for any proud Boston Terrier owner. Our Boston Terrier Hoodie is available on our cotton/poly blend hooded sweatshirts, machine washable in adult sizes S-2XL. Free personalization of any name is included. Looks exactly like the photo. Adorable. Additional Details This personalized gift would be perfect for any number of occasions, including birthdays, the holidays, or a "congratulations, you just got a new dog!" gift. Your family and friends will absolutely love this unique and heartfelt sweatshirt. Our Personalized I Love My Boston Terrier Mug is another great gift option to consider.